Some recent reflections on systemic risk and the financial markets – ranging from details to the big picture. …Although America’s housing collapse is often cited as having caused the crisis, the system was vulnerable because of intricate financial contracts known as credit derivatives, which insure debt holders against default. They are fashioned privately and beyond the ken of regulators — sometimes even beyond the understanding of executives peddling them. Second, America’s National Public Radio’s Planet Money has a lot of recent indepth coverage of the financial crisis in this vein available of podcasts. Including a recent one called the day America’s economy almost died. Looking a more the big economic picture, Predicting Crisis in the United States Economy a profile of Nouriel Roubini discusses the selective vision of models and the biases against discontinuities or nonlinear change. Recessions are signal events in any modern economy. And yet remarkably, the profession of economics is quite bad at predicting them. A recent study looked at “consensus forecasts” (the predictions of large groups of economists) that were made in advance of 60 different national recessions that hit around the world in the ’90s: in 97 percent of the cases, the study found, the economists failed to predict the coming contraction a year in advance. On those rare occasions when economists did successfully predict recessions, they significantly underestimated the severity of the downturns. Worse, many of the economists failed to anticipate recessions that occurred as soon as two months later. We are living in interesting times; in fact, they’re so interesting that it is not currently possible to write near-future SF. … Put yourself in the shoes of an SF author trying to construct an accurate (or at least believable) scenario for the USA in 2019. Imagine you are constructing your future-USA in 2006, then again in 2007, and finally now, with talk of $700Bn bailouts and nationalization of banks in the background. Each of those projections is going to come out looking different. Back in 2006 the sub-prime crisis wasn’t even on the horizon but the big scandal was FEMA’s response (or lack thereof) to Hurricane Katrina. 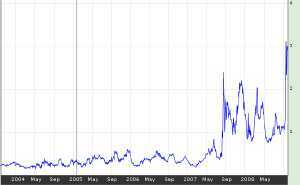 In 2007, the sub-prime ARM bubble began to burst and the markets were beginning to turn bearish. (Oh, and it looked as if the 2008 presidential election would probably be down to a fight between Hilary Clinton and Rudy Giuliani.) Now, in late 2008 the fiscal sky is falling; things may not end as badly as they did for the USSR, but it’s definitely an epochal, historic crisis. Now extend the thought-experiment back to 1996 and 1986. Your future-USA in the 1986 scenario almost certainly faced a strong USSR in 2019, because the idea that a 70 year old Adversary could fall apart in a matter of months, like a paper tiger left out in a rain storm, simply boggles the mind. It’s preposterous; it doesn’t fit with our outlook on the way history works. (And besides, we SF writers are lazy and we find it convenient to rely on clichés — for example, good guys in white hats facing off against bad guys in black hats. Which is silly — in their own head, nobody is a bad guy — but it makes life easy for lazy writers.) The future-USA you dreamed up in 1996 probably had the internet (it had been around in 1986, in embryonic form, the stomping ground of academics and computer industry specialists, but few SF writers had even heard of it, much less used it) and no cold war; it would in many ways be more accurate than the future-USA predicted in 1986. But would it have a monumental fiscal collapse, on the same scale as 1929? Would it have Taikonauts space-walking overhead while the chairman of the Federal Reserve is on his knees? Would it have more mobile phones than people, a revenant remilitarized Russia, and global warming? There’s a graph I’d love to plot, but I don’t have the tools for. The X-axis would plot years since, say, 1950. The Y-axis would be a scatter plot with error bars showing the deviation from observed outcomes of a series of rolling ten-year projections modeling the near future. Think of it as a meta-analysis of the accuracy of projections spanning a fixed period, to determine whether the future is becoming easier or harder to get right. I’m pretty sure that the error bars grow over time, so that the closer to our present you get, the wider the deviation from the projected future would be. Right now the error bars are gigantic.